In the single ply roofing market in the US today the race is on between PVC and TPO thermoplastic roofing membranes. While PVC still has the upper hand and accounts for a significant portion of all residential and commercial single ply membrane installations, TPO is steadily gaining a faithful following and its share in the market continues to grow every year. Out of the two membranes, TPO is the newcomer to the US market, it was initially manufactured and installed in the European roofing market and only made its way into the US in the early 1990’s. 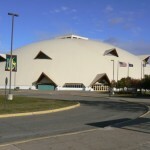 By comparison, PVC has been on the US roofing market since the early 1970’s, and over time has earned a reputation as a high quality durable, and long lasting single ply roofing membrane. Upon entry into the US market, TPO quickly grew in popularity, as it offered all of the advantages of PVC and then some, as well as an economical price that was hard to beat. The only problem with TPO is that despite its marketed advantages, the product actually has a history of very poor performance in the field, membrane deterioration and failures, as well as recalls by numerous manufacturers. The past 10 years have been one long experiment for TPO manufacturers in the US, who are still working on producing a final chemical formulation for TPO that would have all the benefits of PVC, but with a cheaper price tag attached. So far it has been a difficult balance to maintain. Currently, there is no definitive data on TPO membranes that can offer clear evidence about the membrane’s long term durability and performance. The interesting fact is that the issue that TPO is currently experiencing is actually history repeating itself, since PVC went through a very similar cycle of poor performance and failures when it was initially introduced into the US market. It took a number of years for US manufacturers to produce a top quality product that matched the superior performance of its European counterpart. So the obvious question is how come both products that demonstrated top performance and durability in Europe started failing in the US? The answer is very simple: in both cases with PVC and TPO, US manufacturers had the priority of profit over quality. As a result, they did not follow the exact specifications of their European counterparts, producing low-quality versions of both membranes, both of which inevitably faced failures in the field. While PVC manufacturers took care of what needed to be fixed and greatly improved their product, it remains to be seen whether TPO manufacturers will follow suite. Lets take a look at the comparative history of both PVC and TPO in Europe vs USA. All of these long term benefits are possible in PVC roofs that are manufactured with precision out of high quality materials. This has been the case in Europe, which is why for the past 40 years PVC’s share in the European roofing market has steadily grown. According to a 2001 European single ply roofing market study, PVC membranes constituted 61.61% of all installations and volumes were expected to grow by 3-4% annually. By contrast, PVC membranes in the US initially had a very different track record. They were first introduced into the US market in the early 1970’s and were initially imported to the states by European manufacturers. PVC’s advantages were immediately recognized and its share in the US roofing market began to grow as well. However, problems surfaced with PVC membranes that were manufactured in the US and installed in the late 70’s and early 80’s, result in often sudden roof failures, many of which have been well documented. NRCA’s research into this issue clearly revealed that there were a number of significant differences between European vs US versions of PVC membranes. First and foremost, the membrane manufactured in the US was significantly thinner than its European counterpart (only 30-40 inches vs 60 inches). Second, US PVC membranes were unreinforced, poorly formulated and installed in n stone-ballasted applications, none of which was done in Europe. Lastly, US manufacturers failed to take into consideration the fact that PVC membranes that were formulated to function successfully in mild European climates could not withstand severe temperature fluctuations that occur in many regions of the US. During these turbulent times when PVC was getting slammed with a lot of bad press, a number of forward thinking US manufacturers were able to make the appropriate adjustments to the membrane’s formulation. 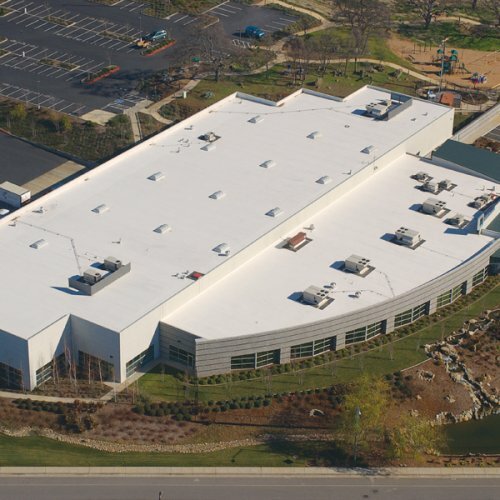 As, a result, they have for the past three decades produced top quality PVC membranes that continue to function across the US today and are considered the best performing single ply roofing product. TPO’s history has closely followed in the footsteps of PVC. TPO membranes were first introduced in Europe in 1991, and actually go by the name FPO ( Flexible Polyolefin) and very shortly after, in the early 1990’s, migrated to the US under the name TPO (thermoplastic polyolefin). However, similar to early PVC, the TPO membranes that are currently produced in the US differ drastically from their European counterparts in a number of very significant areas that have a direct impact on their performance and longevity. One of the most critical differences is that European FPO membranes are on average 0.064 inches (1.6 mm [63 mils]) thick, while most TPO membranes in the US are 45 mils. What makes matters worse is that a number of the products labeled “45 mils” actually have as little as 32 mils of actual polymer. Another difference is that to achieve proper dimensional stability, European manufacturers of FPO are known to use fiberglass reinforcement in addition to polyester reinforcement. US manufacturers do no such thing. Also, to achieve consistent seaming, European manufacturers wipe the seams with solvent before welding ( even with new materials), while most US manufactures do not follow suite. Perhaps the most telling evidence of poor quality of US manufactured TPO vs European FPO is the price. In Europe, a well formulated, high quality, thick FPO membrane is actually more expensive than a high quality PVC membrane of the same thickness. However, in the US, TPO membranes are a much cheaper commodity than PVC and, in fact lure prospective customers with their low prices. As a result, it is not surprising, the TPO in the US has experienced major issues with membrane integrity and performance. 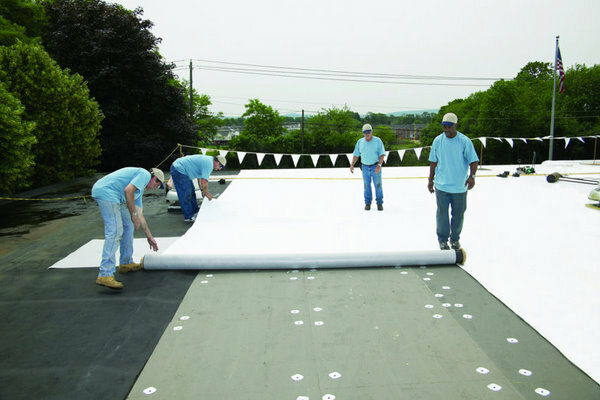 For example, results from a 2002 study presented at the Midwest Roofing Contractors Association Convention in Chicago, caused alarming concerns: none of the 5 leading TPO membranes produced in the US and installed directly applied directly over isocyanurate insulation at 1/4″ per foot slope passed a Class A fire rating. In fact, Dens-Deck® was required to keep the fire from spreading (ASTM E-108 Test) below 6′ (Class A Rating). At this point, US manufacturers are still tinkering the formula for TPO, but it is not clear whether they are moving in the direction of making major quality improvements, as prices for TPO continue to remain low. This comparative history of the two single ply membranes and the evolution of their performance in the US vs Europe can serve as a word of caution for roofing contractors who are considering installing US manufactured TPO membranes. It is best to work with a reputable contractor that has a proven track record of TPO membrane’s performance that you can review. It is up to you to determine the length of time that you would be comfortable designating as sufficient to prove the membrane’s quality. Also, it is critical to avoid dark-colored TPO membranes and ones that use brominated fire retardants, as these have been proven to have lower durability ratings in various tests conducted by NRCA. Additionally, it is recommended to stay away from adhered TPO roofing membranes, as they are known to move excessively and glues have a hard time sticking to them. To conclude, any roofing contractor who values his reputation and cares about the long term success of his business needs to do serious research and evaluate whether the perceived economical advantage of TPO over PVC is worth the risk of installing a potentially sub-standard quality product. roofing materials. Anyone who has current information would be greatly appreciated. Sika Sarnafil and Soprema are BIG European manufacturers of PVC (and maybe TPO) that I know of. I’m sure there are many more, but I’m in US, so not very versed in Euro market. There is also a Bauder who produce a great quality product such as PVC and FPO membranes. I have a Trocal roof that was installed in 1990 and it only started to fail a few years ago. And the failure only occurred on the laminated flashing material which I believe had the old formula PVC on it as opposed to the membrane used which I was told was a new more UV resistant formula. The flashing material is de-laminating but not where the membrane covers it so even though the flashing material cracked and peeled away from the sheet metal it still didn’t cause a leak. I’ve been patching it with Eterna bond membrane material and thats been holding up. At this point I think I need to replace the roof to just get away from all the potential problems. But if the flashing material held the roof would probably last another ten-20 years in my opinion. I was very pleased with the Trocal product and wish the flashing material held up too. I’m in LI NY and need a good installer if anyone wants to quote the project. roofing materials. You appear to have a lot of information. Iss there any way you could send me a list of the manufacturers you are awre of? As a former employee of Trocal, your hypothesis that US manufacturers dumbed down the formulas is just not true. We were importing PVC roofing from Germany and those membranes shattered. It was the American based manufacturing arm that had to convince the Germans that we needed reinforcement. What i heard from veterans of the industry, is that originally, unreinforced Trocal membrane was ordered by US military, and then Trocal began selling it commercially. I will make necessary adjustments, after further research into the matter. PS – Who do you represent now? All Rights Reserved - if you copy, your roof will start leaking!